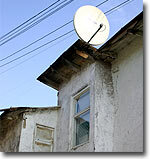 Channel One of the Russian television is once again available without satellite dishes in the mining town of Angren in the south of the Tashkent region. Russian-speaking population of Angren has numbered thousands since the Soviet era. Mines are closed these days, sending the unemployment soaring and living standards plummeting. Broadcasts of the Russian TV network has certainly made the population happy, providing an opportunity to forget numerous problems. Still, residents of Angren, both Russian-speakers and Uzbeks, keep wishing the TV-Orbita city studio went on the air again. Before it was closed by the authorities, TV-Orbita used to broadcast Channel One programs together with local news. State control structures are getting the upper hand in the confrontation with the independent TV studio that began two years ago. TV-Orbita Director Tamara Prokopieva says that international non-governmental organizations (it was interaction with them that cost TV-Orbita its broadcasting license despite what the authorities are saying to the contrary) withdrew from Uzbekistan and abandoned their former charges, leaving them without jobs but with the repute of politically "disloyal". Autumn 2004, shortly before election of the parliament of two houses, was marked by a scandal between Uzbek mission of Internews Network (a non-governmental organization assisting private TV networks) and the recently established National Association of Electronic Media Outlets. Internews Network backed the idea of a dozen regional studios to establish a non-governmental TV network. The organization even got a grant from USAID to buy sophisticated broadcasting equipment with. The National Association of Electronic Media Outlets headed by Firdavs Abduhalikov (a businessman from Samarkand) objected to the idea and insisted on a regional network under its own aegis. Most regional TV studios in Uzbekistan soon joined Abduhalikov's Association and pledged to broadcast only permitted programs. The obstinate ones were closed. The authorities traditionally used all sorts of allegedly legitimate claims that served as smoke-screen for the actual reason. TV-Orbita in Angren was one of the studios that chose independence. Two years ago, Internews Network often presented TV-Orbita as a successful private TV network that owed its success to the skills its managers had acquired at Internews Network's management, advertisement, and journalism seminars and training courses. Prokopieva wouldn't join the National Association of Electronic Media Outlets because the package of programs it stipulated included few broadcasts in the Russian language which she felt was wrong for the Angren audience. Enjoying normal relations with Angren city administration, TV-Orbita was nevertheless compelled to go off the air when the Agency for Communications and Informatization accepted the duty to the tune of 2 million sums or $2,000 but withheld its broadcasting license. On December 9, 2004, a fortnight before the parliamentary election in Uzbekistan, state controllers sealed the premises with TV-Orbita's broadcasting gear and equipment. Angren citizens were enraged by the authorities' decision to leave them without their favorite TV programs. Left without jobs, TV-Orbita journalists went our of their way to persuade them not to boycott the elections. In March 2005, state control bodies appealed to the prosecutor's office to press charges against Prokopieva for unlicensed broadcasting. The prosecutor's office turned the request down. It found no corpus delicti in Prokopieva's actions because the latter had never received any official documents on licence withdrawal and ban to broadcast. On the other hand, absence of these documents did not permit journalists to go to court for defense of their rights and indemnity. No courts would back TV-Orbita's claims against the actions of the authorities. "I did not act through courts alone," Prokopieva told Ferghana.Ru. "When the Uzbek authorities suspended operations of Internews Network in spring 2005, I received a call from Eric Johnson of Internews Network Europe. He suggested establishment in Tashkent of a new organization that would perform the functions once performed by Internews Network and support private TV studios. Internews Network mission was closed soon after that, and thus began my correspondence with Oleg Katsiyev (the head of Internews Network in Kazakhstan and Central Asia) and Catherine Aldridge (ex-chief of the Tashkent office who had moved to Almaty). Katsiyev and Aldridge confirmed Johnson's words. They promised me aid, financial and legal, they told me to go ahead and rent an office, and they endorsed the documents I had prepared for registration." Prokopieva: The Tashkent hokimijat denied us registration in December 2005 on the pretext that most founders, former TV-Orbita executives, were registered as residing in the Tashkent region and not in Tashkent. (Actually, what the permanent residence address has to do with it is anybody's guess. The law at least has no objections.) I met with Johnson in January 2006 and he assured me again that the offer still stood. Aldridge told me in the meantime that if the non-governmental organization could not be registered, then USAID would even finance a profit organization working in the sphere of non-government television. I rented an office on Taras Shevchenko Street and had a bank account opened by autumn. That was when Aldridge told me that her contract with Internews Network was over and advised me to stay in touch with Johnson from then on. I contacted him to hear that he did not think that any future work in Uzbekistan was possible. An incurable optimist and enthusiast, Prokopieva wouldn't be put out. "The TV-Orbita episode proves that existence of a private TV network in Uzbekistan possible in principle, even when its broadcasts are restricted to a single town," she said. "The state decided that it could do without it for the time being. Western structures decided likewise, structures like Internews Network that pledged assistance to development of independent media outlets and other democratic institutions and did assist them. Uzbekistan changed its foreign political course in 2005 and 2006 and hopes for rapid liberalization of the country flickered out. These structures grew disappointed in their ability to set up instruments of influence with the population in Uzbekistan and withdrew, never giving a thought to the people who had been taken in by their promises. TV-Orbita has not capitulated. The fight is not over yet.